Common beans are an important food legume faced with a series of abiotic stresses the most severe of which is drought. The crop is interesting as a model for the analysis of gene phylogenies due to its domestication process, race structure, and origins in a group of wild common beans found along the South American Andes and the region of Mesoamerica. Meanwhile, the DREB2 transcription factors have been implicated in controlling non-ABA dependent responses to drought stress. With this in mind our objective was to study in depth the genetic diversity for two DREB2 genes as possible candidates for association with drought tolerance through a gene phylogenetic analysis. In this genetic diversity assessment, we analyzed nucleotide diversity at the two candidate genes Dreb2A and Dreb2B, in partial core collections of 104 wild and 297 cultivated common beans with a total of 401 common bean genotypes from world-wide germplasm analyzed. Our wild population sample covered a range of semi-mesic to very dry habitats, while our cultivated samples presented a wide spectrum of low to high drought tolerance. Both genes showed very different patterns of nucleotide variation. Dreb2B exhibited very low nucleotide diversity relative to neutral reference loci previously surveyed in these populations. This suggests that strong purifying selection has been acting on this gene. In contrast, Dreb2A exhibited higher levels of nucleotide diversity, which is indicative of adaptive selection and population expansion. These patterns were more distinct in wild compared to cultivated common beans. These approximations suggested the importance of Dreb2 genes in the context of drought tolerance, and constitute the first steps towards an association study between genetic polymorphism of this gene family and variation in drought tolerance traits. We discuss the utility of allele mining in the DREB gene family for the discovery of new drought tolerance traits from wild common bean. The online version of this article (doi: 10.1007/s00122-012-1896-5) contains supplementary material, which is available to authorized users. 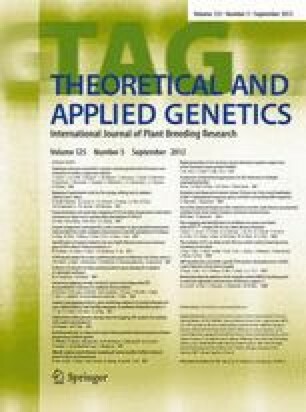 The authors wish to thank A. Soler and L. Díaz for DNA extractions and the personnel of the CIAT Genetic Resource Unit and CIAT bean program for seed characterization and multiplication. They also acknowledge the Cornell Biotechnology Center for support in sequencing. Sequencing by D. Brunel and team is gratefully acknowledged, too. This research was supported by the Generation Challenge Program and had technical support from the ICRISAT genomics center.